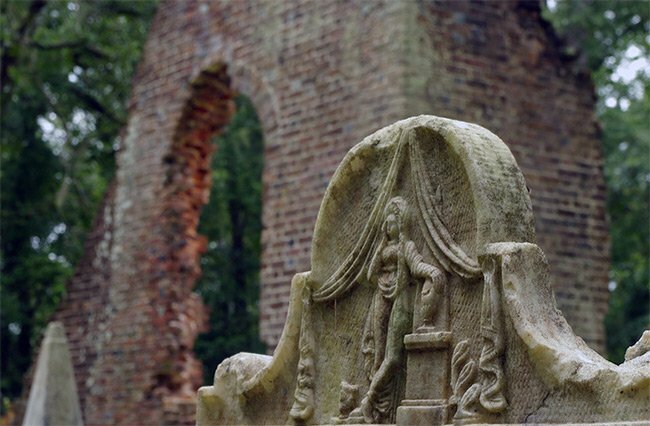 Two walls, part of a cistern, and the churchyard are all that remain of the Pon-Pon Chapel of Ease in Colleton County. 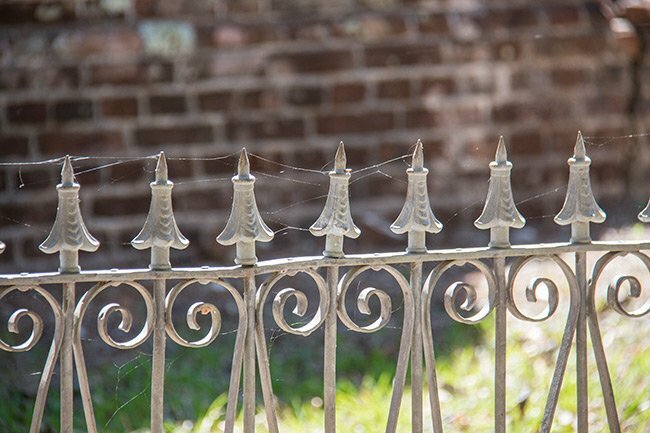 The name “Pon Pon” is an Indian phrase that possibly meant “big bends” in reference to an early settlement along the Edisto River. In fact, the section of the Edisto that winds around the area of the former settlement is sometimes called the Pon Pon River. After the Church Act of 1706 made the Church of England the official church of South Carolina, the province was divided into 10 parishes, each governed by a vestry of seven men. A parish church – where births, marriages, and deaths would be recorded – was to be established in each parish, with chapels of ease erected throughout the parish to accommodate those who lived far away. Only worship services were conducted at these smaller chapels, leaving official records the business of the parish churches. 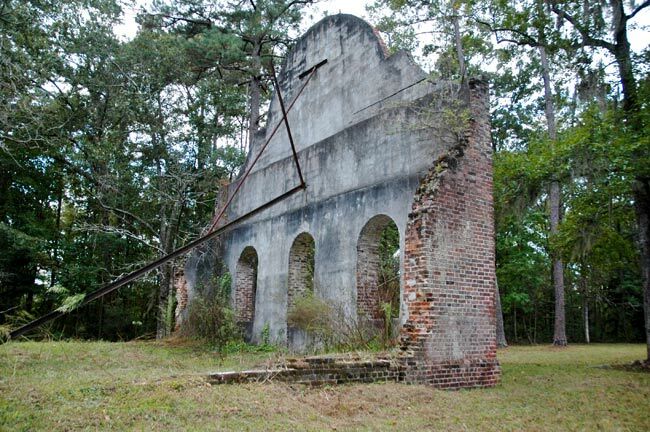 St. Bartholomew’s Parish (now Colleton County) was one of South Carolina’s original parishes, and initially several chapels of ease were built within the parish because the location of a central church was disputed among parish leaders. 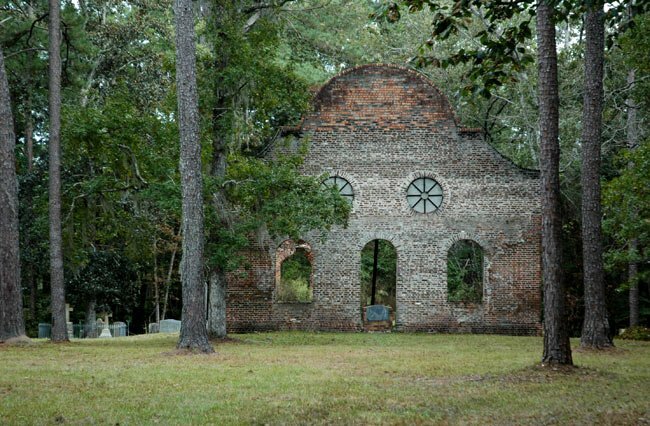 One early chapel, for example, was located at Parkers Ferry Road, once a bustling stagecoach road between Charleston and Savannah. 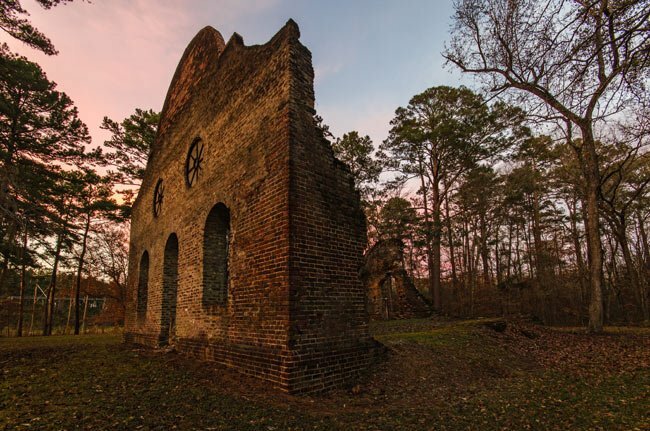 When much of the parish was destroyed during the Yemassee War of 1715, the population dispersed, and St. Batholomew’s suffered even more difficulty in trying to establish a parish church location. 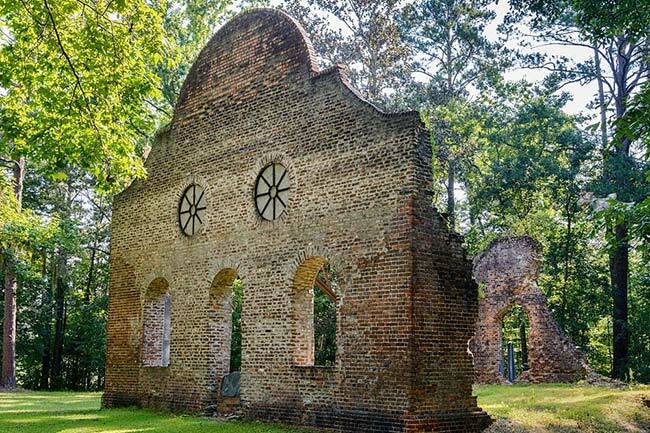 Finally on December 9, 1725, the Assembly of the Province of South Carolina permitted a church to be built here and act as both parish church and chapel of ease, a unique arrangement in South Carolina. A wooden church was built on or near this site soon after the 1725 decision. John Wesley, the founder of Methodism, preached in this wooden building twice on April 24, 1737. In 1754 a brick structure replaced the wooden one. 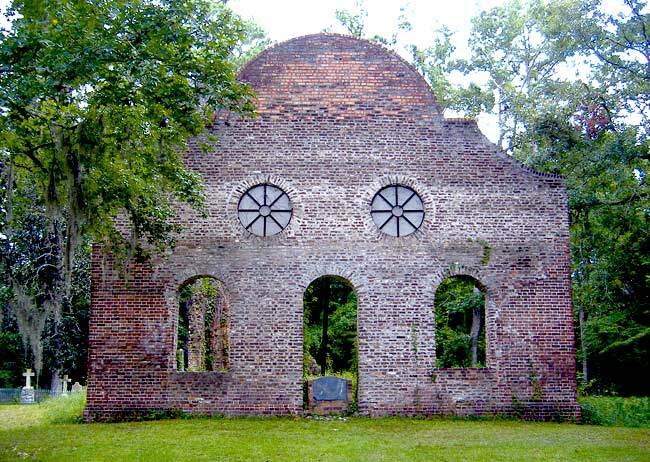 The brick church burned in 1801. From that point, the chapel became known colloquially as Burnt Church. It took around 20 years to rebuild the chapel following the fire; the new sanctuary was completed sometime between 1819 and 1822. Sadly, in 1832 it was once again destroyed – either by fire or another devastating event – and this time, it was not rebuilt. Interestingly, although the church was reduced to ruins, families continued using its churchyard for their burials. A 1959 hurricane toppled much of the remaining ruins, further eroding the structure. However, the two standing walls allow viewers to imagine the chapel of ease as it appeared in its youth. 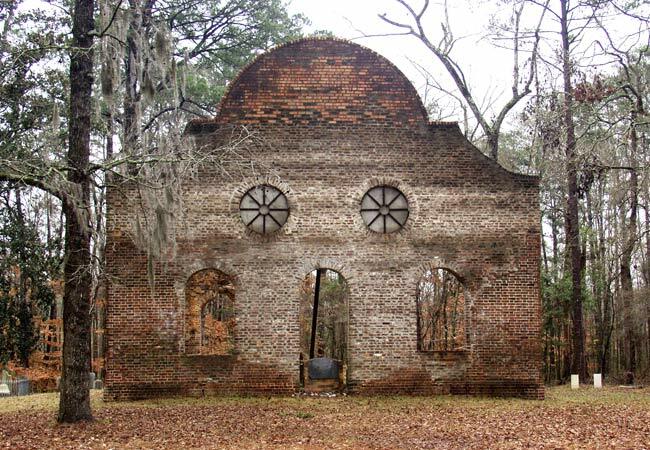 The South Carolina National Heritage Corridor is currently helping to fund a restoration effort of the ruins, overseen by the Colleton County Historical and Preservation Society. 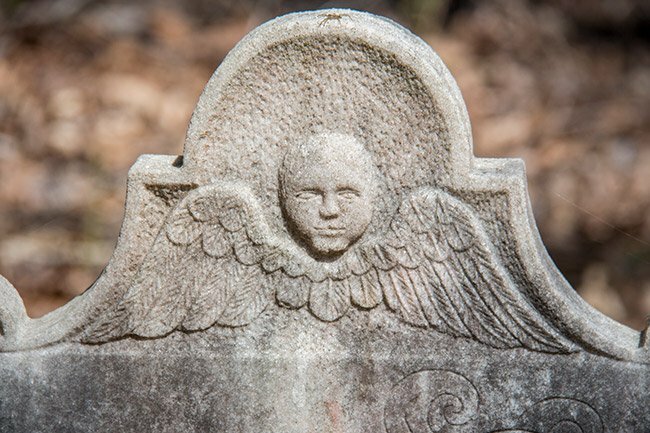 Many prominent figures in South Carolina and Colleton County history are interred in the burial grounds at Pon-Pon. To learn more about the legislators buried here, the Political Graveyard has an entry under Burnt Church Burial Ground. 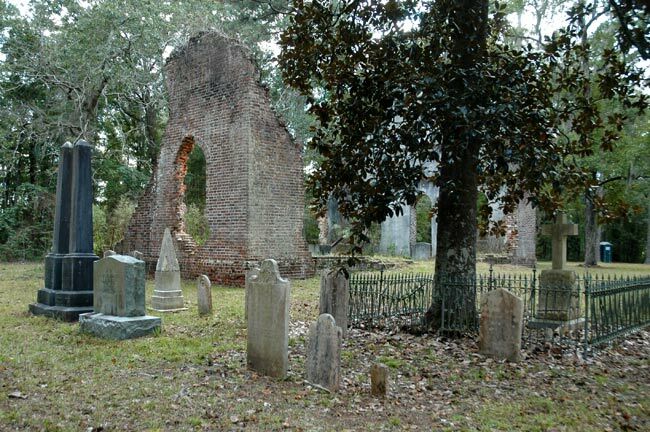 The church and cemetery can be found at a place called Burnt Church Crossroads – off SC 64 just outside of Jacksonboro. The grounds of Pon Pon were temporarily closed to the public following damage caused by Hurricane Matthew, which swept through the state on October 8, 2017. The walls of the church still stand, but many trees and limbs toppled during the storm and others are in danger of falling (see below). 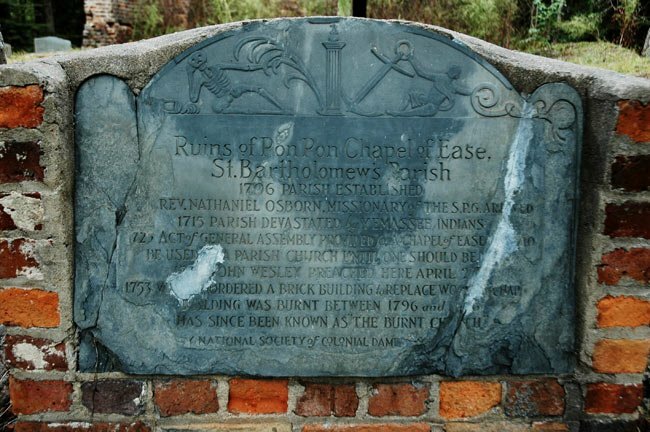 Established in 1725 by an Act of the General Assembly, Pon Pon Chapel of Ease was one of two churches serving St. Bartholomew’s Parish after the Yemassee War (1715) aborted plans for a parish church. 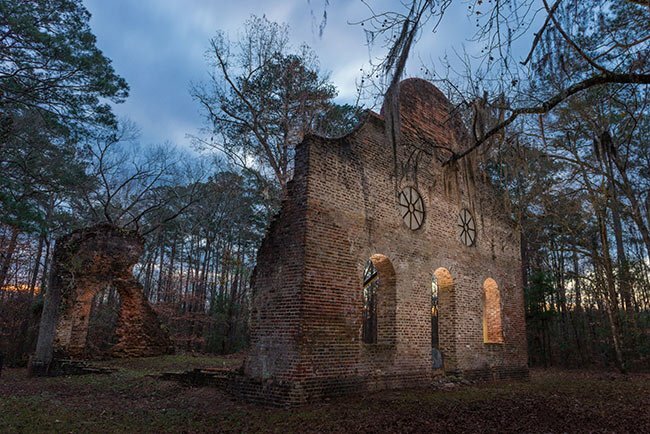 The chapel site was located on Parker’s Ferry Road, the busy stagecoach thoroughfare that connected Charleston and Savannah. In 1754, a brick chapel was erected to replace the earlier wooden structure. 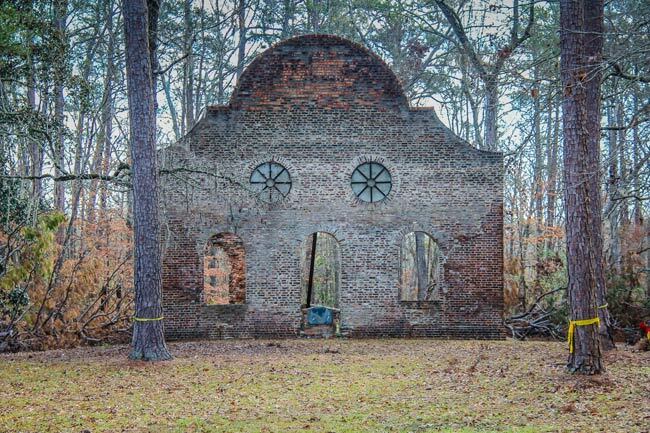 This brick chapel burned in ca.1801, causing Pon Pon Chapel to become subsequently known as the Burnt Church. The chapel was rebuilt between 1819 and 1822, and was in use until 1832 when it was again reduced to ruins. The façade of Pon Pon Chapel had a central, rounded arched entrance flanked by rounded arched windows on either side, all constructed in a brickwork pattern of one stretcher alternating with two headers. The two round windows in the façade’s upper level utilized the same brickwork pattern. The walls were constructed in Flemish bond. 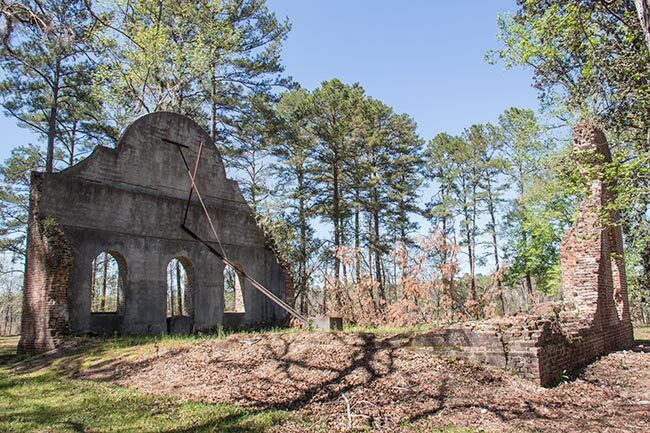 The chapel’s historical significance is due in part to Rev. John Wesley preaching two sermons here on April 24, 1737 and for its burial ground that contains the remains of Congressmen Aedanus Burke and O’Brien Smith, in addition to numerous local leaders. Captain John Herbert Dent is buried at the cemetery on Highway 64 between Jacksonboro and Neyles Crossroads going towards Walteboro. A large tree has grown from his grave. Are any St. Bartholomew’s vestry records still in existence anywhere? 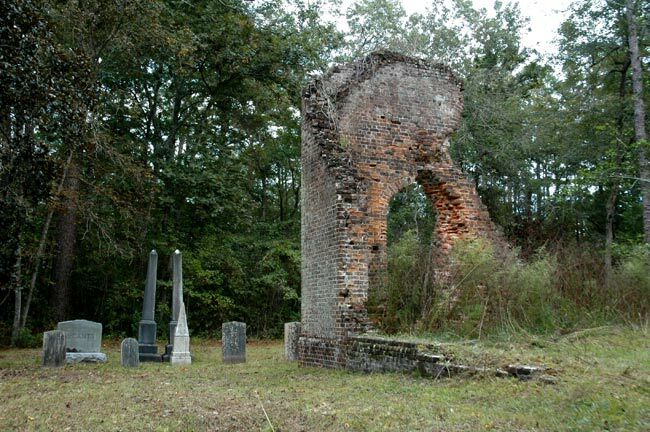 There was no church burnt during the Yemassee War. In 1715-1717 only the parish area existed and no actual church. I’m sorry that Lori thinks the historical society rewrote the history, but primary documents and research have revealed the true story. My husband and I used to go to the Burnt Church frequently. Before the Historical Society fenced it and ruined it. Where are the markers of the children that died? 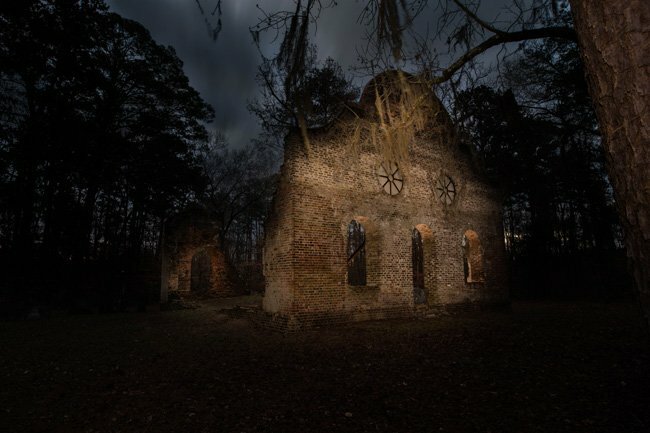 Why do they not recognize the Yemassee Indians that burned the church down as well? The entrance clearly tells the story. Why did they rewrite history with their little paper you get when you go now? We choose to believe the true story as written on the Church entrance tablet. In which Indian language was Pon Pon settlement, please? Wonderful photos and history! Steven — you mentioned that nearby a Capt. of the USS Constitution is buried — who was he? Do you have the name of this person? And thank you Steven for all of the great photos you submit to us! Our gallery and website wouldn’t be the same without you! Great find! I rarely get to that part of the state but always find interesting bits of history when I do! Thanks SCIWAY for the history behind it.